Boracay has been rated as the most beautiful island in the world by numerous different magazines and websites. While, some critics say Boracay is being ruined by tourism, I agree with Boracay's praisers. Here is why! If you aren't already sold by the water and sand, then I have a lot more reasons that will win you over. Boracay is a heaven on earth. The people are some of the friendliest I have met anyplace. The beaches look like postcards. And, there are more activities than you have time for. Also, the night life is top notch. -It is only 3.98 square miles! To get to Boracay, you must fly in to either Caticlan Airport or Kalibo airport. You will likely be flying in from Manila. I used Philippines airlines. But, Cebu Pacific and Air Asia also operate flights. Caticlan airport is the closest option. Caticlan is about a 15 minute ferry ride from Boracay jetty. Yet, it will cost you more than flying into Kalibo. Kalibo is about a 1.5 hour van ride away from the jetty port to Boracay. However, it will cost you only around $150 dollars round trip from Manila, as opposed to around $200 roundtrip to Caticlan. Once you get to the jetty port, the ferry ride is simple. Upon arrival at the port in Boracay, there are dozens of tricycle riders eager to take you to a hotel. Relax on the beach- Boracay is known for its white sand beaches and clear blue waters. You could spend days tanning and looking at the mesmerizing beauty if that is what you enjoy. Island Hopping Boat Tours- For about $20 US you can take a traditional Filipino boat for the day. On these tours you visit Magic Island, Crystal Cove, Snorkel, have a complementary local style buffet lunch, visit Puka Beach and more. If you don't think this is good value then I don't know what to say. Not to mention Puka Beach is one of the most picture perfect beaches I saw. 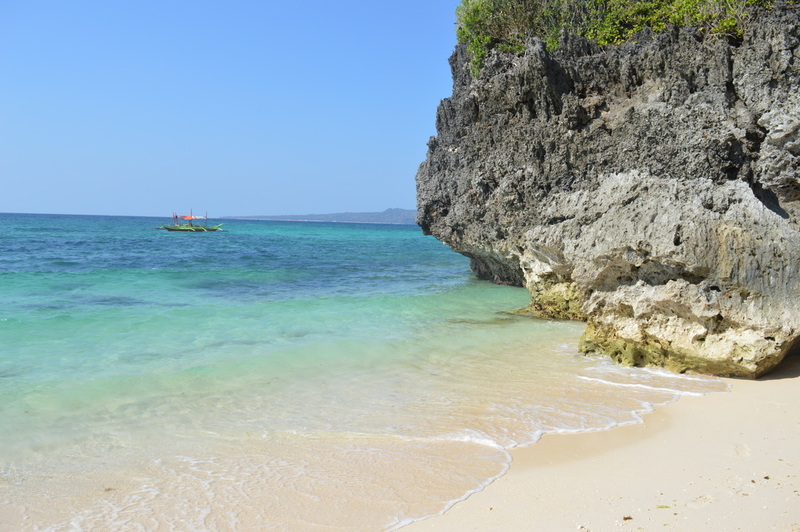 Cliff Jumping- If you are up for a thrill, there is plenty of cliff jumping in Boracay. You can take a full day tour of purely cliff jumping which is on the pricey side since it is monopolized by a single company. The other option is to do it at Magic Island on the Island Hopping tour. This is what I did and it was such a blast. I got to know the local lifeguards and they all started doing tricks so I could get some great pictures. Parasailing- Didn't actually get around to doing this myself but it looked like a lot of fun. Sailing at Sunset- Just before sunset, you will see dozens of sailboats gathering by the shores of White Beach. You can pay a few bucks to sail around during sunset. Bar Crawl- A famous bar crawl and a really good time. Highly recommend! MNL Beach Hostel- I stayed here and really enjoyed my stay. It is located in the main city center and only about a five to ten minute stroll to white beach and U-Mall. The hostel itself provides clean beds that are basic but comfortable. The best part of the hostel is its roof top lounge and bar where travelers mingle and hang out. I met a bunch of awesome people that I spent the rest of my stay with. I highly recommend staying here if you are a solo backpacker or a group looking to meet friends. It will cost you around $15 US per night. The District, Boracay- A moderate priced option that is right on the sand of White Beach. You are a step away from the central beach area in Boracay. Didn't stay here, but heard from others that they really enjoyed their stay here. Shangri-La's Boracay Resort and Spa- This is the top of the top and one of the nicest resorts in SE Asia. A single nights stay in one of the bungalos will set you back at least $1000 a night. That being said, it is a five star hotel set on it's own private beach on an island that has been voted the most beautiful in the world. So if you are on a honey moon or have the money to drop, this is the place to go! To be honest, Filipino food definitely wasn't up there on my favorites. Compared to the flavor and power of food in places such as Thailand and India, the food was very bland. It mainly consisted of lightly flavored meats, seafood and rice. There was nothing wrong with it and I still enjoyed it. That being said you can find food from all over the world in Boracay. There is even Starbucks, Mcdonalds and a Dominos! The people in the Philippines are incredibly friendly. I met many locals, and had long and interesting conversations with some of them. We were both intrigued to learn about each others lives. If you are ever in need of advice or help, they are almost always ready to offer you some words of wisdom. There are few beggars that approach you. One exception to that is people trying to sell you hats, waterproof phone cases (that don't actually work), and tours. The culture of Boracay is very diverse since there are so many tourists on the island. You can definitely see the locals way of life but a lot of it has been shaped by tourism.